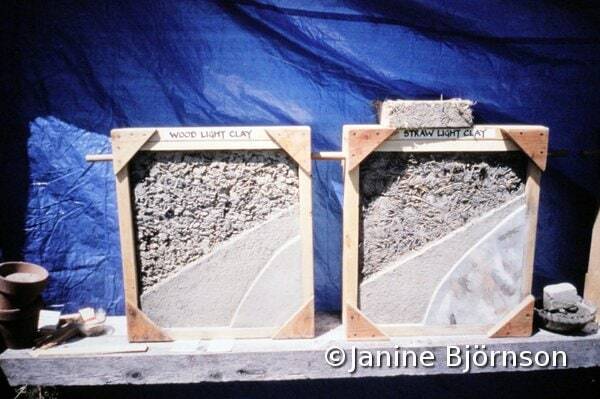 German natural builder Frank Andersen made these demonstration panels of slip and chip and straw clay. The finish consists of two layers of clay plaster. 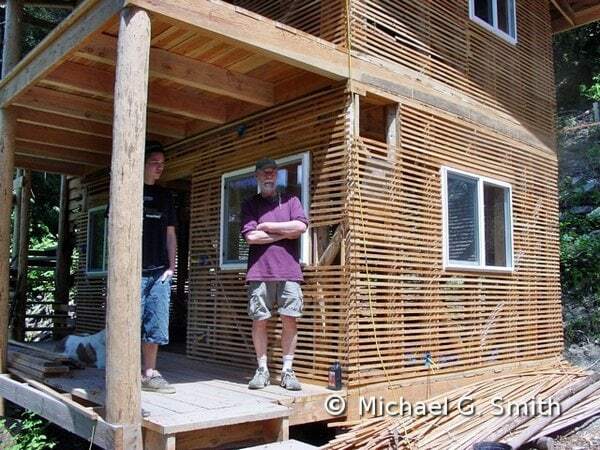 The frame of this cabin has been wrapped in wooden lath preparatory to filling the walls with slip and chip. This technique is very similar to straw clay, only using wood chips or shavings instead of straw. The chips are lightly coated in clay slip and then packed into a wall cavity, providing thermal and acoustic insulation. Because the resulting wall is a bit weaker than other infill systems, we often use permanent lath of thin wooden strips, branches, or reed matt. Slip and chip is most suitable in forested regions where wood is a locally available resource but straw has to be imported.